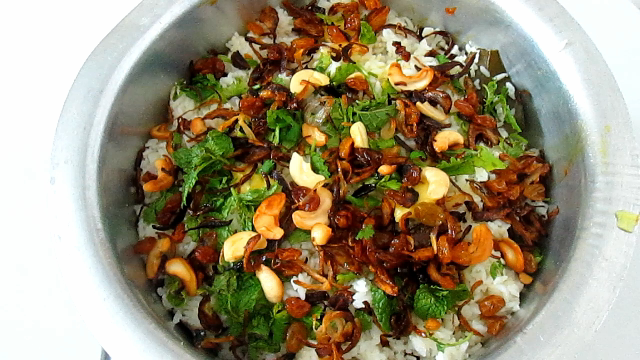 Hello there, Today I am sharing a special biriyani recipe.. eid is coming.. So this biriyani is especially for Eid. I love any dishes with prawns. I always love to make new dishes with prawns. Prawns biriyani is one of my favourite biriyanis... From my childhood, my mom makes this prawns biriyani for Eid lunch. She doesn't like any meat. 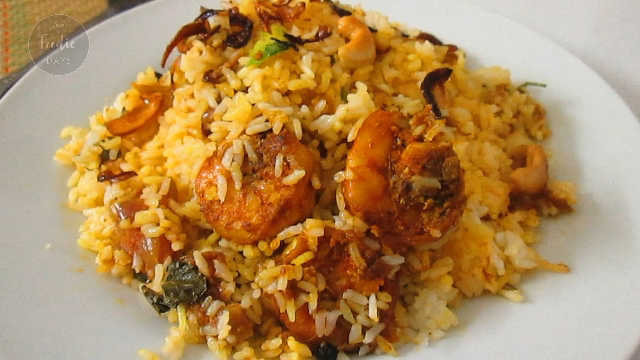 So we always prefer fish biriyani or prawns biriyani. I made a slight difference from that biriyani. But it tastes awesome. I miss my home and biriyani which is prepared by my mom. Prawns-500 gms, peeled, deveined and washed. Ginger and garlic paste-1 teaspoon. Onion chopped-3 numbers, Medium size. Green chillies-3 to 4 chopped. Star anise -½ star anise. Coriander leaves-finely chopped, as required. Mint leaves- Chopped, as required. Pineapple essence-1 teaspoon. or Chopped pineapple -half cup. Marinate the prawns with all the ingredients under marination. Keep this in the refrigerator for 30 minutes. Shallow fry the prawns and keep it aside. Heat a pan with ghee in it. Fry cashews until it turns a golden colour. Remove from the pan. Fry raisins until it puffs up. In the same pan shallow fry sliced onion.Set this aside. 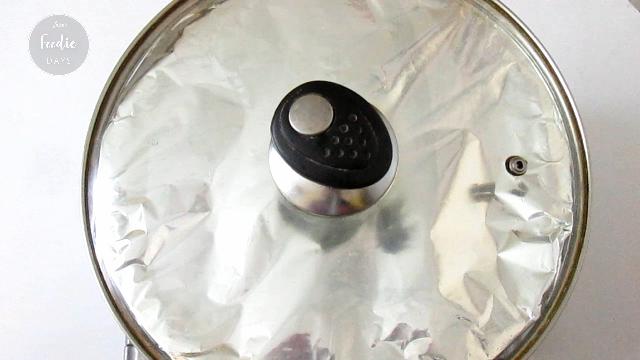 Heat a pan with 2 tablespoons of oil. Add ginger garlic paste. Saute for few seconds. Add green chillies and curry leaves. Saute for few seconds. Add chopped onions and salt. Saute until onion becomes translucent. Add turmeric powder, red chilli powder and garam masala powder. Combine well until raw smell gone. Add chopped tomato and cook the tomatoes. Add coriander leaves, mint leaves and lime juice. Combine well. Now add fried prawns to this gravy and mix it well. 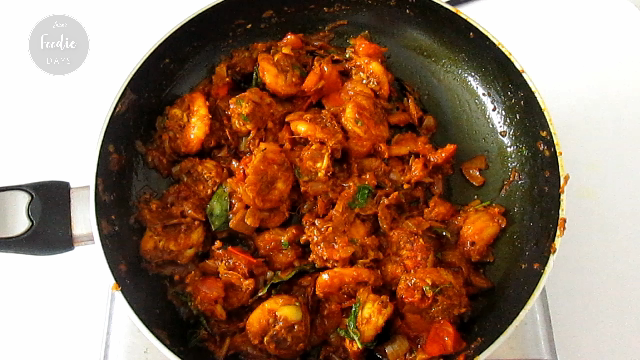 Prawns masala is now ready. Keep this aside. Wash and soak rice for 15 minutes. Drain the water and keep it aside. Heat a large vessel with 1 tablespoon of ghee. Add cloves,cardamom,star anise,cinnamon stick,black pepper,bay leaf and onion. Saute until the onion becomes soft. Add the rice to this. Roast for 2 to 3 minutes. Add 4 cups of hot water. Add salt to taste and lime juice to this. Mix it well. Cover this and cook on low flame until all the water has been absorbed. When rice becomes cooked remove from the flame and set aside. 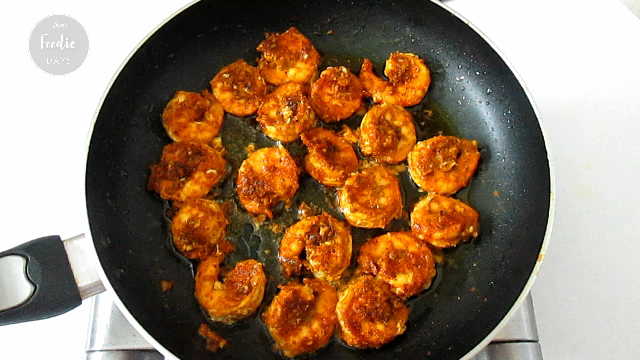 Apply some ghee at the bottom of a heavy bottomed pan.place 1/2 of the gravy(prawns masala) at the bottom and spread it. Wait for 20 to 25 min... Awesome biriyani is ready... Serve it with pickle, onion raita & Papad.